If you listen to fishing lore, the ocean is a scary place full of sea monsters. There are sharks. Then there are squid the size of school buses. And then you have whales that dive down to unfathomable depths to eat those squid. Even smaller animals like sea snakes and jellyfish have the ability to send you right to the ER. And then you have “Devil Rays.” These swimming stealth bombers have horns that stick out of their heads. Fortunately, the advent of scuba diving has been slowly setting the tall fishing tales straight. Sharks aren’t as terrible as we thought; whales are actually quite friendly; and as it turns out, manta rays don’t have spines, teeth or even pitchforks with which to cause injury. Their giant size, graceful nature and gentle disposition have earned them a top spot on nearly every diver’s bucket list. 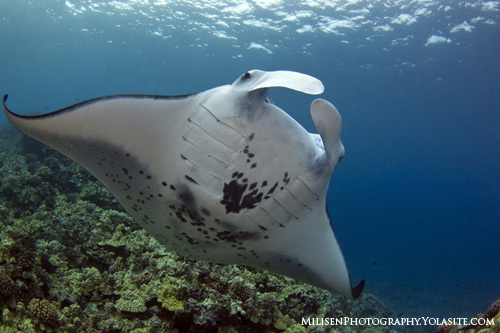 So what should you know about manta rays that may help bring home that perfect shot? These are the smaller of the two species, smaller being a relative term. They can attain a width of 18 feet and as their name suggests, generally stick close to shore. Coastal mantas come in one color variety. Look for shoulder slashes that run parallel to the angle of the mouth and white underbellies with black spot patterns. These black spots are actually unique for every coastal manta ray and have been used in photo-identification studies to tell the mantas apart. Normal morph - These animals have black mouths and more angular shoulder slashes that can cut straight over the top of the body. On the underside, look for larger black blotches and a charcoal lining to the wings. Melanistic morph - These animals are solid black all over with small white patterns in the area of their gills. Leucistic morph - These animals are mostly white on both surfaces. They are incredibly rare. Their gargantuan size leaves them off the menu for most oceanic predators. 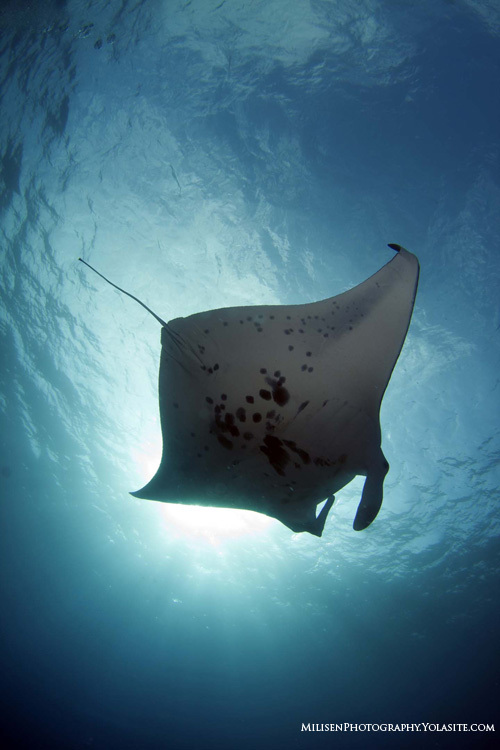 Powerful wings enable mantas to outrun the rest. So if nothing eats mantas, where do they sit on the food chain? 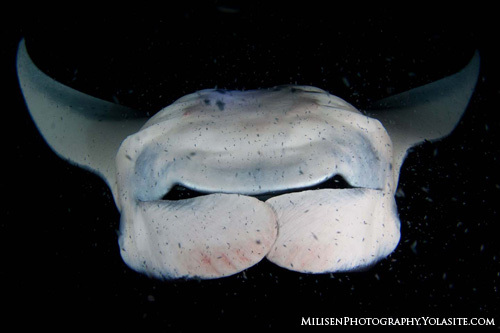 Similar to most natural giants like whales and dolphins, mantas eat plankton. 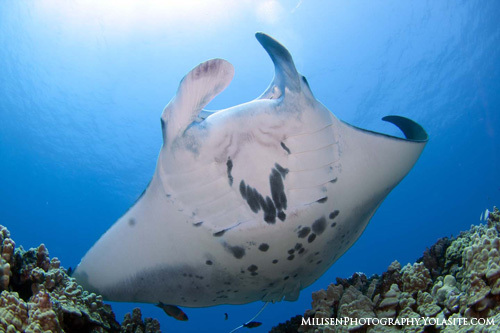 Five percent of their body mass per day is required to keep an adult manta swimming happily. At an average of 100 pounds per foot of wingspan, a 15-foot wide manta must eat 75 pounds of plankton every day. Their specialized diet means that mantas must spend their days filtering through high concentrations of plankton. 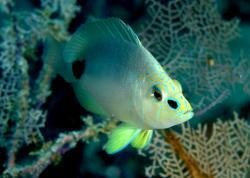 Their usual habitat includes areas of upwelling currents, reef channels or other high nutrient areas. Oftentimes, high nutrient loading translates into less than optimal water clarity. One of the best places on Oahu to find mantas, for example, is Kaneohe Bay where the visibility, unfortunately, rarely exceeds 20 feet. Both species of manta ray occur circumtropically. 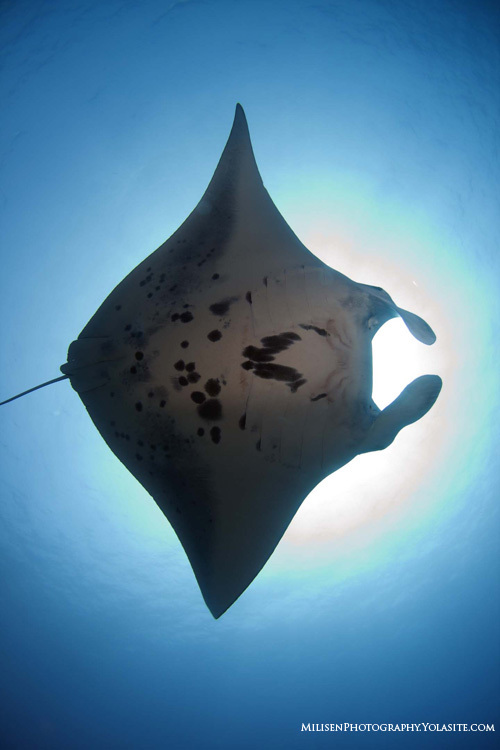 If you are traveling specifically to see mantas some good bets include the Maldives, Bali, Isla Mujeres, Socorro, the Great Barrier Reef and Yap. 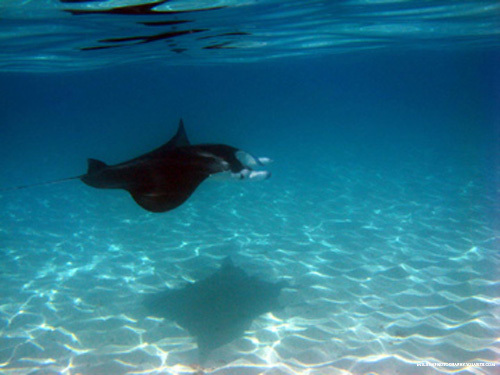 If you really want an experience though, Kona Hawaii proclaims itself as the manta capital of the world. 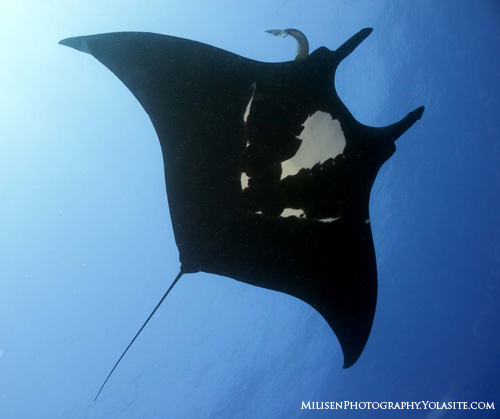 Kona’s reefs have many cleaning stations where mantas can be encountered during the day with some degree of reliability. Once the sun goes down the action really starts to heat up. Divers gather at one of two sites and work together using their dive lights to concentrate the plankton. And to the delight of the guests, as many as 40 mantas have been known to cue in and spend their evenings swooping through the plankton clouds. You can expect closer-than-close encounters. 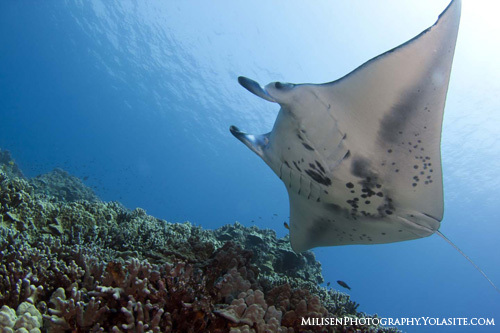 The mantas will cruise within inches of your head, often giving you a slap as they swim past. The lights from hundreds of divers create an atmosphere more akin to a Vegas show than a coral reef, complete with giant, dancing stage performers. This really is the ultimate manta experience. Both species of manta ray are considered by the International Union for Conservation of Nature (IUCN) as near threatened, and as recently as last year they were listed on the Conventions for International Trade in Endangered Species (CITES) Appendix II. Their population worldwide is declining. Threats to manta rays include entanglements with marine pollution, climate change and ingestion of plastics. The biggest threat comes from overfishing. Artisanal fisheries and bycatch in other fisheries may be taking unsustainable numbers of manta rays locally, while a market for manta gill rakers as medicine in China is driving a commercial market. Mantas are especially at risk because they start as relatively low populations, reproduce slowly, take many years to mature and have a low rate of distribution. To monitor the take of mantas and find out what we can about their movements, a number of studies set up worldwide are utilizing the unique spot patterns on mantas’ ventral surfaces to tell the animals apart through photo identification. Photo identification is an effective way to gather similar information as tagging studies without the related stress of capture. Studies in Mozambique, Brazil, Socorro, Japan, Mexico, Ecuador and Hawaii are helping to identify distinct populations for more effective management. Here are a few quintessential manta shots. Use these as a creative starting point and then feel free to add your own twist, be it a diver, marine life, boat or other unique aspect to make the shot yours. Whatever your desired shot, the only lens you will want with mantas is a fairly wide one. I prefer the Tokina 10-17mm at 10mm for cropped sensors, but full frame users do well with a 14mm or 15mm prime. Manta in Sunburst - This shot is pretty self-explanatory. The premise is to shoot from under the animal, placing the sun behind it. The trick is to expose for the surface water about 10° off from the sun and use your strobes as a fill light to get detail in the shadowed underbelly. Use live-view or the viewfinder to compose the shot and wait until the moment where manta and sun are in perfect eclipse. For a neat trick, try to find an animal near the surface and take advantage of Snell’s window to capture some clouds or elements above the surface. 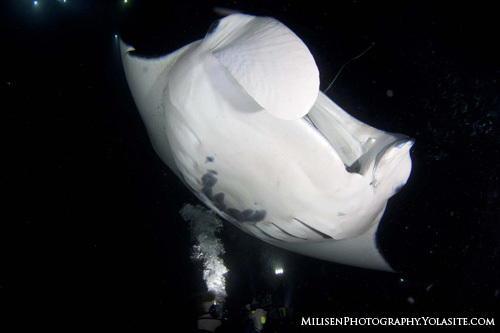 Night Mantas - Attracting a manta to your dive lights is one thing. Nailing a wide-angle shot at night can be a little trickier. The problem is the plankton. 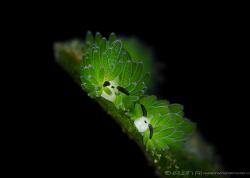 Try holding your primary dive light away from the camera and lens to attract the plankton and resulting backscatter out of your image. The animal will be feeding excitedly, so wait until it is posing just right before pulling the trigger. Power the strobes low so as to not blow out the bright white underbelly. There may even be enough ambient light to try bumping up your ISO and shooting with just ambient light. Reefscape - To pull off a reefscape, it really helps to have a cleaning station where the animal will predictably come through the composition multiple times. It is best to think of reefscapes in three parts. The foreground could be the manta or it could be an interesting coral formation. The mid ground will usually be whichever reef or manta was left out of the foreground. The background is going to be some variety of blue, perhaps with a diver or boat in silhouette, but often it will just be the rippling surface. A large part of the skill in any marine animal encounter is in how you conduct yourself. While the first impulse is to swim directly at the animal in an attempt to get closer, mantas can swim much, MUCH faster than you and will do so if spooked. A better alternative is to sit back and allow the animal to become comfortable with your presence. Mantas are highly intelligent and will often become inquisitive on their own. The point is to let the manta come to you. Only after a rapport has been established is it appropriate to compose your shot and hit the shutter button. Our understanding of manta rays has come a long way since fishermen first coined the term “Devil Ray.” But we may be loving them to extinction through overfishing. The dive tourism industry is offering hope. Mantas have already been protected in many areas because tourism has shown they are worth more alive than dead. So the next time you travel, support the conservation cause by asking to see the area’s manta rays. Your ticket purchase will be sending a message that these are animals worth saving, and you will be in for the encounter of a lifetime.